2019 is the 21st time this popular race is taking place! The We Benefit 99er Cycle Tour will once again be having a special schools category team event in the 57km race! Prizes will be awarded for the 1st, 2nd and 3rd placed school team. Teams will consist of 4 riders. There will also be a special prize for the school with the most entries. You also have the unique opportunity with We Benefit to earn back your race entry fee! Visit The We Benefit 99er Cycle Tour promo page from more details! Enter The We Benefit 99er Cycle Tour now and don't miss out! As always there will be great infrastructure, medals and lucky draw prizes. Cyclists aged 12 years must be accompanied by a participating adult. Full event info on www.99er.co.za. 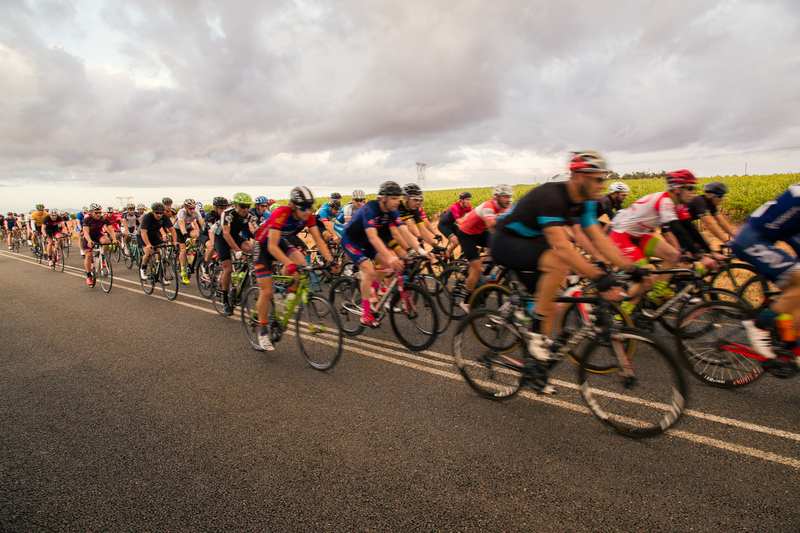 Cyclists leave Durbanville Racecourse and follow a quiet route through Durbanville to exit via Wellington / Klipheuwel Road (R302). Shortly after Okavango intersection, cyclists turn right onto Lichtenburg Road (R312), pass Fisantekraal and cross the R312/R304 “fruit sellers” 4-way stop. The R312 climbs to the R44 where cyclists turn left towards Wellington. Route change: Continue on the R44 past Windmeul Winery and Vryguns (Voor-Paardeberg) intersection. 6km Farther, turn left at the 2nd Voor-Paardeberg Road towards Perdeberg hill. At the T-junction, cyclists turn left onto Slent Road, pass Paardeberg Correctional Services and cross Vryguns (1st Voor-Paardeberg) Road. Cycle the newly tarred Slent Road, continue straight over the Malmesbury - Stellenbosch Road and pass the Klipheuwel silos. Turn right onto Philadelphia Road (R304), cycle the rolling hills past Adderley Road (M58) intersection (Cut-off point) and over the single lane bridge. Route change: 1.2km Farther, turn left onto Van Schoorsdrif (Old Malmesbury) road. Cycle the uphill, then downhill past the Ostrich ranch. Turn left onto the N7 (keep left, traffic for 2.6km) and left again onto Vissershok Road (M48). Cross Malanshoogte / Contermanskloof 4-way intersection and face the challenging Vissershok climb, culminating with the King of the Mountain. Continue past Meerendal and turn right into Odendaal Street for the last 400m climb to the new finish area before Pienaar Street, followed by a 2.5 km neutral zone back to the Race Course. Cyclists follow the 102km route up to the Lichtenburg Road (R312) turnoff, at which point the 57km route continues straight on Klipheuwel Road (R302). At the Philadelphia Road turn-off (Klipheuwel), cyclists turn left onto the R304 to join the 102km route from there to the finish. Full road closure has been applied for the portion of Van Schoorsdrif (Old Malmesbury) Road (DR1111) from the R304 (Philidelphia Road) to the CTN Ostrich Ranch turn off. Marshals will provide cycling route around pothole areas where unable to repair. Road closure has been applied for the portion of Vissershok Road (M48) from the N7 to Meerendal Wine Estate turn off (lane uphill from the N7). Pot holes on Vissershok Road (M48) will be suitably repaired for cycling conditions. From the N1, take the Durban Rd/Willie van Schoor Rd off-ramp and pass Tygervalley Centre towards Durbanville. Turn left into Tindale road. At the T-junction, turn left into Racecourse road. Pass the Durbanville Nature Reserve on your right; then follow the parking signs to the Durbanville Race Course. GPS: S: 33°50.27; E 18°38.24. See PPA website for interactive directions. Late entries can be done at number collections or on race day. These entries are subject to availability and will not be seeded.